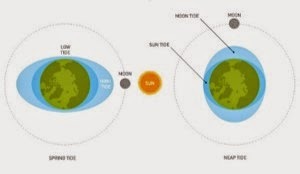 The balance between the gravitational force of the moon and the rotation of the moon around the earth creates a force that acts on the oceans creating a bulge of water. So you get a hump or bulge of high water on either side of the earth. The moon also pulls the earth towards it but this is very small. 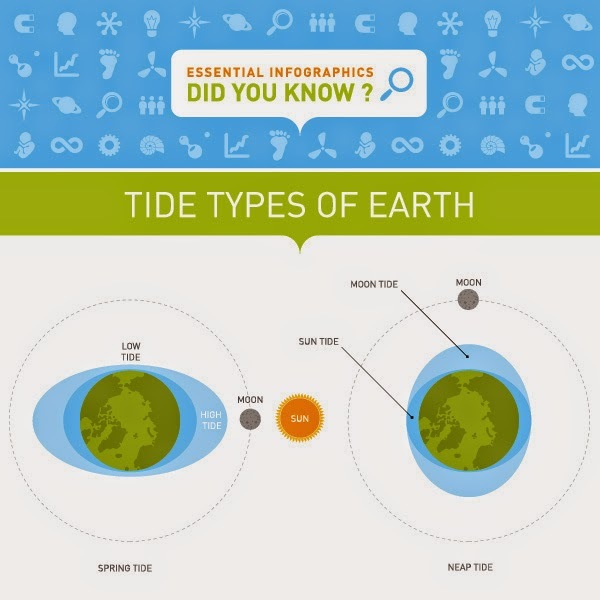 As the Earth spins, you, standing on the earth at one spot, experience high tide, low tide, high tide and then low tide. The sun also has an effect on the ocean. When it is at 90 degrees to the moon it reduces the effect of the moon on the tide. The sun is higher in the sky in the summer than it is in the winter. Also the moon’s orbit isn’t actually circular, but an ellipse… so sometimes it’s further away from the earth and other times it is closer. There’s one cycle of the moon and Earth that only happens every 18.61 years. Like in 2015 when we'll be seeing a couple of media labelled 'Supertides'!